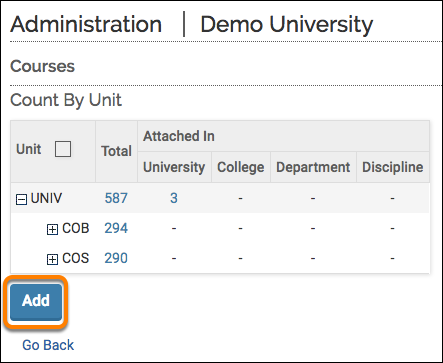 Courses can be added to FACULTY180 on an individual basis, as compared to performing a bulk upload, at any time. 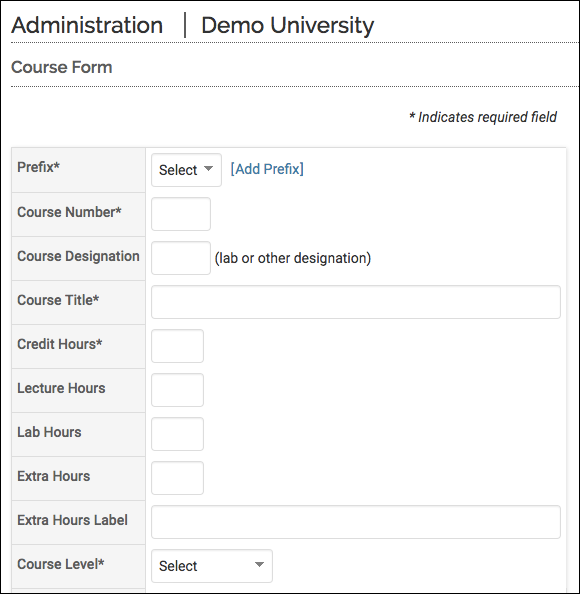 The basic information for a course, including the course prefix, number, title, and credit hours can also be changed as necessary. If a course taught is uploaded to FACULTY180, but the actual course has not been added to FACULTY180, an exception will be noted while uploading the course taught. See Activity Input: Initiate Faculty Input Process for more information. On the Navigation menu, select the Admin section, then click the Administration page. Click Courses in the Add/Edit section. The Courses screen displays. Click Add on the Count By Unit form. The Course Form displays. Enter the details for the new course. Note the required fields. Click the unit associated with the course to be edited. The Manage Courses screen displays. The courses assigned to the selected unit are listed. Click the Edit icon adjacent to the course to be edited. The Course Form for the selected course displays. When you are finished, click save the information.